Widespread adoption of augmented reality (AR) technology by consumers can be attributed to the increasing popularity of wearables and smartphones. The AR market is expected to grow from $11.14 billion in 2018 to $60.55 billion by 2023. Smartphones have further eliminated the dependency on custom-designed devices, such as AR glasses, and instead offer an everyday usage platform to host AR apps on. This favorable ecosystem has led to businesses and various industries exploring a range of practical use cases for AR maps. AR maps involve overlaying digital information on the physical world, similar to other AR applications. In addition, AR maps introduce geospatial awareness and tap into users’ location coordinates. Here’s a look into a few use cases of AR maps by industry. From basic navigation on streets, to finding the shortest route to a subway station, to taking a virtual city tour, augmented reality has many applications in the world of travel and tourism. For a traveler who is new to a city, apps supported by AR maps act as virtual companions—they can guide toward the nearest cafes and landmarks. You can locate the nearest hotel that satisfies your requirements such as large room size, pool, or a specific cuisine. You can also point your phone camera at a hotel building in front of you and get details about it. Our friends at YouVisit created a university campus AR map using the WRLD SDK. Interactive walls in hotels and airports function as digital brochures. Point your phone at a marker on the wall, and you can get directions to and information about the selected location. Healthcare is projected to be the second largest industry user of AR applications, second only to video games. AR maps can be a lifesaver during emergencies: with sensors attached to critical devices like defibrillators, the maps can pinpoint the location of these devices and reduce the time it takes to respond to an emergency. AR maps also help on the patient side too, such as navigating large hospitals to find the hospital room of a loved one or to find a department for a medical appointment. Big retail giants use AR maps in their physical stores to efficiently guide customers to products. The customer can create a product list and the map will propose the ideal route to find all the products. As the customer walks through the suggested route, special deals and discounts are highlighted on the map. Customers can also compare multiple products on the shelf to determine the best buy. The retailer itself can benefit tremendously from the use of AR maps. This dynamic, 3D representation of the space shows how shoppers move through the space and how that affects the sale of certain products. Retailers can use this information to place products in the optimal location, and large retail complexes can tap into this data to ensure shoppers move through the shopping center as a whole. Our friends at InMall have used the WRLD SDK in their shopping mall app. AR maps can help architects, designers, and their clients virtually “step inside” buildings, before they are ready for construction. In 2017, using AR maps and computerized automatic virtual environment (CAVE) technology, a construction company enabled a client to visualize and modify the design in the initial stages, saving $475,000 in the process. They developed an AR mobile app to build excitement in the University of Washington community about the new computer science and engineering building, which was to finish construction in January 2019. Users could simply point their smart phones at the construction site or even a printed handout to gain an immersive experience of the building. Urban planners, too, use a similar approach to design smart cities. AR technology offers entirely new ways to experience spaces long before they are built. In business logistics, AR maps help bring down costs and increase efficiencies through improved directional awareness. For example, AR map-based apps assist pickers in large warehouses with efficient navigation to items by superimposing coordinates on a 3D representation of the warehouse. In last mile delivery—one of the critical stages in logistics where the product is arriving to the client location—AR technology helps professionals determine the optimal course to destination, get to the exact building or apartment, and locate the delivery package in the truck. Field workers, especially in large-scale field operations like a wind farm, can see on the map which equipment is malfunctioning and receive AR-enhanced directions to it. AR map technology is also used in equipment diagnostics—by sending a digital map to the senior workforce, newer employees can get remote on-field assistance. They can also be trained faster by using graphic representations of facts, manuals, and other documents, which helps new employees understand the lay of the land quicker. One of the most popular use cases of AR maps is gaming apps, which use location-based information from smartphones to create a virtual overlay of an imaginary world on the user’s real environment. Users walk through familiar streets and landmarks but can interact with fantasy creatures and hunt for treasures. Pokémon Go is a well-known example of the interest created by this blurring of both worlds. 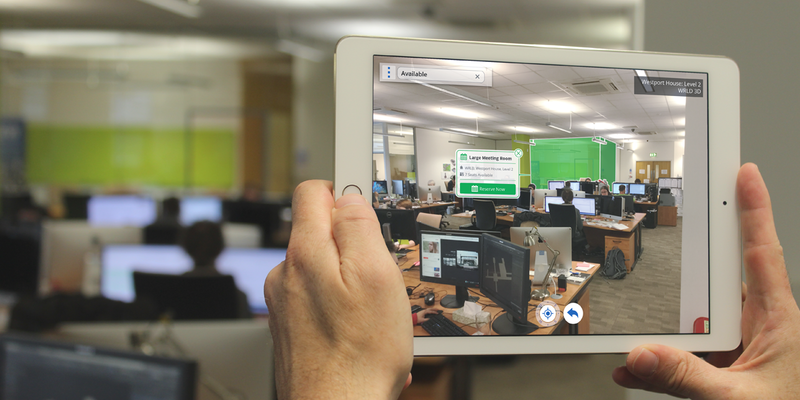 Augmented reality, along with IoT sensors, help create a digital twin of a physical office. This can help new employees easily navigate the office, and any employees to locate available conference rooms or find the quickest route to a certain place. Furthermore, virtual walkthroughs of in-construction workplaces can help optimize real estate and suggest design changes before implementation. Accenture’s 2018 Technology Vision Report says 80% of executives believe it will be important to use extended reality technology. The full potential for AR maps is yet to be realized, and its application can go far beyond healthcare, gaming, retail, and other industries mentioned here. As consumers and businesses become more familiar with the technology, AR will become a larger part of everyday life. Contact WRLD to get started creating your AR map today!